The key to a keeping your horse sound and moving forward with energy is engaging his back. Here's how it's done. "Engage his back!" called the trainer. "If I had a 'real' dressage horse, I'd have an easier time engaging his back", fumed Doris silently. "But I don't have that kind of money." "Topline, topline, topline—I'm so sick of hearing about my horse's weak topline", thought Ralph, as he ignored his trainer and aimed his horse for the next jump. "That's all just to make the horse look pretty, right?" If you're like Doris, you may be surprised to find that the most common culprit preventing a horse from engaging his back properly isn't poor conformation or lack of pedigree but improper riding. If you're like Ralph then it may come as a surprise to find all of the following conditions stem from a common problem: A weak topline—the section of a horse's body that extends from the poll to the croup. 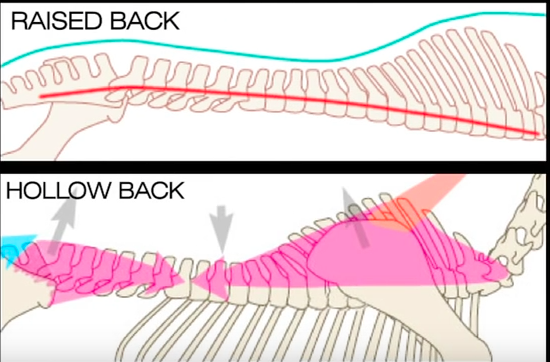 ​Kissing spine: Notice how the vertebra are compressed against each other. Horses that have this extremely painful condition will typically refuse to go forward, and will frequently buck. ​Hunter's bump: Notice how the vertebra in the lower back are dislocated and swollen. Horses with this painful condition are often seen in the hunter/jumper world. ​In each case, the deformities were caused by riding a horse with a hollow back and over arched neck. Here is what an inverted back looks like under saddle (left) and what it does to a horse's spine (right). ​Broken crests: Notice how the third and fourth vertebra are unnaturally separated. It is not that unusual these days to see horses with this extremely painful condition at the top levels of dressage. 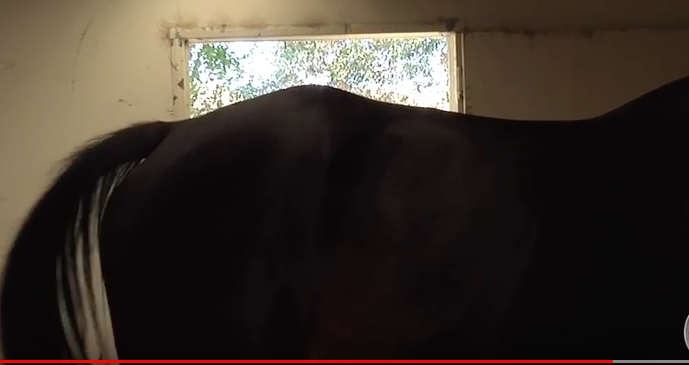 In this excellent video, trainer Karen Loshbaugh and Equine Veterinarians Dr. Joanna Robson, Dr. Sarah le Jeune, and Dr Sue Dyson explain why proper engagement of the horse's core is crucial for avoiding these debilitating and painful back injuries. ​While the video is quite detailed in explaining why core engagement is so important in avoiding these disorders, it is a bit light on how it is done. The steps are straightforward. First, it is necessary to have a secure, flexible, and following seat. Do you grip with your thighs or knees? Do you grip with your calves even when you are not in two-point? Then you do NOT have a secure and following seat. You can read more about that here. Second, you need an elastic rein contact. A horse will NOT go forward into fixed, rigid, nervous, twitchy, loose, or unfeeling hands. Kick or tap all you want with your whip. It's a losing battle. But a horse will willingly go forward into an elastic, feeling contact. In fact, he will seek contact with your hands. Read more about that here. Third, you need to know how to keep your horse "on the bit"—and that does NOT mean keeping her face on the vertical. It means keeping your horse engaged throughout her body through a connection with your hands and your seat. You can read more about that here. 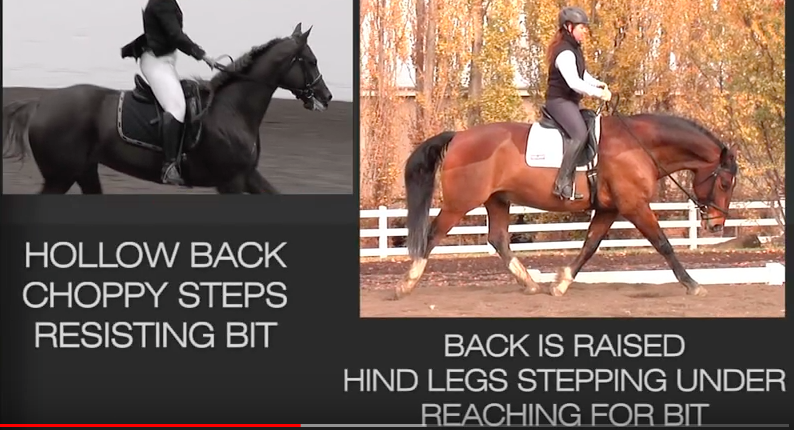 ​Fourth, you need to learn how to allow and encourage your horse to raise and stretch his back while under saddle. This is what the video refers to as a "long and low" carriage. This is NOT the same thing as a "peanut rolling", a term used by Western riders to describe a horse that is not engaged and is simply "all on his forehand". The video shows the difference. 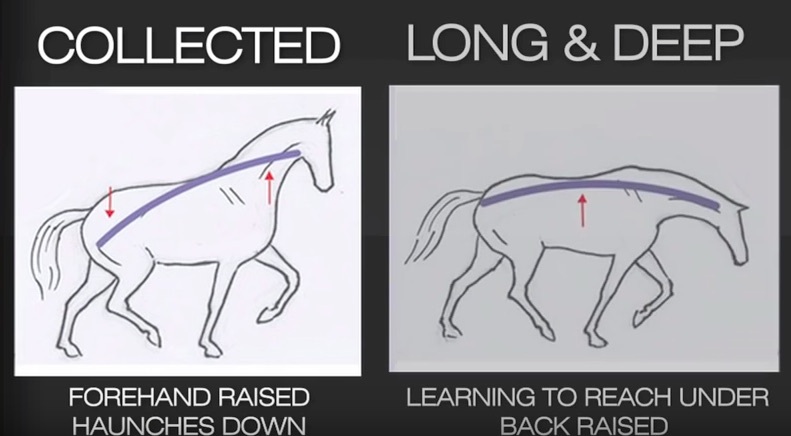 You can read more about how to teach your horse to stretch down through his back properly here. Fifth, you need to learn how to engage your horse's hindquarters—his powerful engine that drives all of his gaits and keeps him "on the bit". You can read more about how to engage a horse's hindquarters here. Sixth, you need to know how to execute the perfect half halt. No, half halt doesn't mean slowing your horse down. It means rebalancing him and putting him back "on the bit" with more engagement from his hindquarters. You can read more about how to do that here. When all of these things are in place, you are read for collection. You can read more about that here. You can also use side reins to help you develop your horse's topline. Read more about that here.